Dennis Hogan with coach Glenn Rushton, Jeff Horn and Queensland Tourism Minister Kate Jones after his victory over Jamie Weetch. 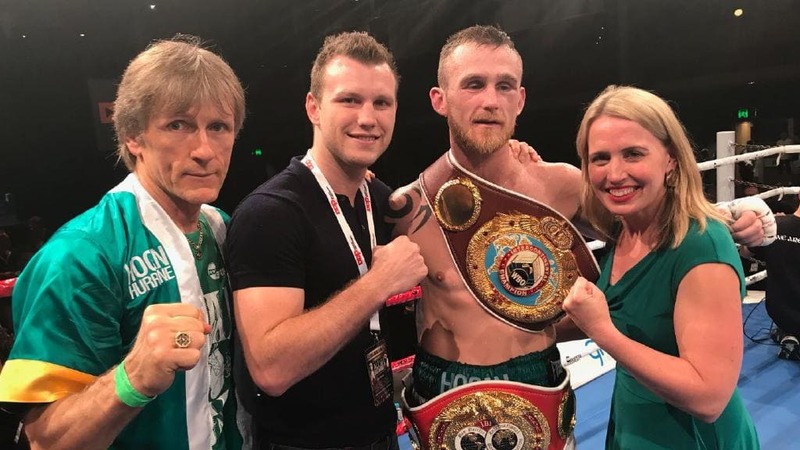 World title challenger Dennis Hogan 28-1-1 (7) believes his experience over the championship distance will be the difference in his fight against WBO junior middleweight champion Jaime Munguia 32-0 (26) at Arena Monterrey in Monterrey, Mexico on Saturday night. The 34-year-old Australian-based Irishman finished off his training camp in Los Angeles and says he is in the best shape of his career ahead of the fight. “It feels very good to get the last hard session going and it’s just a matter of tapering it off. That feels good. You start to freshen up. I’m fresh enough as it is. I’ve come through training really well,” Hogan said to RTE this week. Hogan has been the 12 round distance four times and the 10 round distance seven times while Munguia has been past the sixth round just three times. “Everything is after coming together,” Hogan continued. “Everything is feeling good. The whole body is good, the muscles are loose which is great. I’m feeling very strong. All those rounds he hasn’t had because of the knockouts are rounds I got in and had experience. “I found out what it was like to be in there and problem-solve in those situations. When he gets in those situations there’ll be big questions asked and I’ll be asking those questions of him.